luci collectd-mod-network collectd-mod-interface "realtime network traffic"
I installed OpenWrt Backfire 10.03.1-RC3 on TP-Link WR841ND router (Atheros chipset). WAN port - disabled, WAN connectivity is provided via another router. Rebooted router. I see "Realtime Network Traffic" and "Realtime Wireless Status" in Status menu. Connected two PCs to this router. Both are able to ping each other, and access Internet. But there is no traffic going - 0.5-1.0 kiB/sec. on the chart. Started pinging from one host another one, and gateway. Than I open File Manager on one PC, and copy ISO image (700MB) from 2nd PC to local disk. And ... there is no traffic in "Realtime Network Traffic" - just the same 0.6 kiB/s. This is fresh install, no additional modifications after installation have been made. OpenWrt-Realtime_Network_Monitor-No_traffic.jpg​ (89.1 KB) - added by Vadim Plessky <v.plessky@…> 7 years ago. 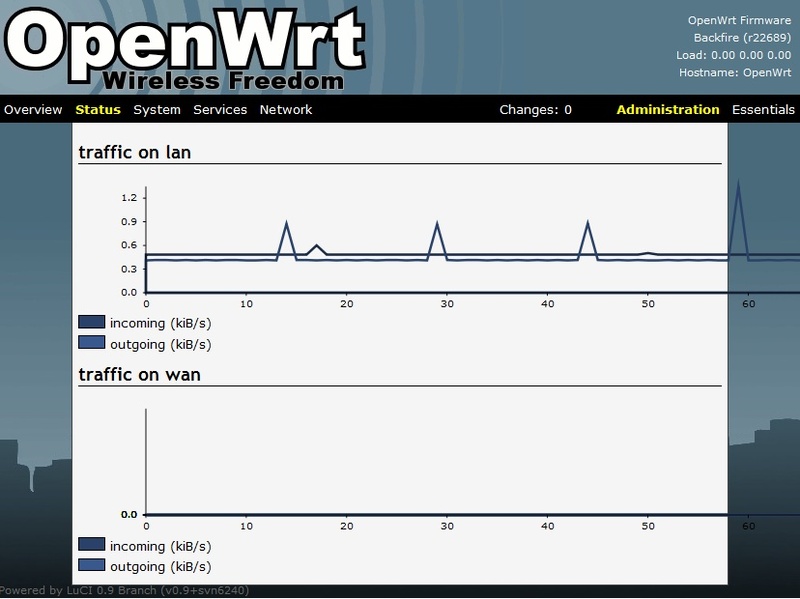 OpenWrt Realtime Network Monitor - No traffic - 0.5-1.0 kiB/sec. Experiencing the same issues with luci-app-livestats. Having the live stats open generates traffic as well.